Measurements Database, designed for economical storing and easy managing of experimental data, provides convenient and fast way of searching and retrieving information. This software let one to get rid of a great amount of paper needed to keep information about the measurements as well as to avoid routine manipulation with computer files, folders, etc. Each record in the Observat table describes particular measurement and contains such experimental parameters as Sample Position, Start Time, Duration, etc, as well as array of the measured data. Several records from the Observat table are related to one record in the DataSets table (relationship "many-to-one"). This relationship reflects the experimental configuration when measurements of the same sample under the same external conditions are being performed in series. In this case, certain number of particular measurements should be collected into a group corresponding to the investigated object. Information, which is the same for every measurement within one group (like Guest, Sample, Date), is stored in the DataSets table as one record. Such relationship between the Observat table and the DataSet table, besides compressing of the information, allows to retrieve the whole set of measurements by selection only one record in the DataSet table. All parameters related to the DataSet and described all measurements within one group are stored in the Parameters table. This table is related to the table DataSets by "many-to-one" relationship. The ExtParameters (External Parameters) table is used for storing External parameters such as Temperature, Concentration and so on. Table ExtParameters is related to the DataSets table by "many-to-one" relationship, so it is possible to link a number of External parameters to the particular DataSet. Additional reason for constructing ExtParameters and PNames tables is the possibility of visualization of the fit parameters as a function of a particular External parameter. 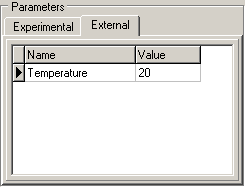 If a series of measurements, for example, at Temperature = 10C, 20C, 30C, … was performed, one has to add a parameter 'Temperature' in the PNames table (if this parameter had not been entered before) and add a record in the ExtParameters table with the name 'Temperature' and Value = 10 and so on. The PNames table was designed in order to avoid mistakes while writing names of parameters. One should first enter the name of a new Parameter in PNames table than choose it from a drop-down list in the ExtParameters table. There are two auxiliary tables in the database: table Guests and table Samples. The first one contains information about person or organization who orders measurements, and the second one provides the detailed information regarding the explored sample. Both tables are related to the table DataSets by "one-to-many" relationship. Such a configuration makes possible to list all measurements performed for a particular person or a particular sample. At the other hand, all information about particular experiment (including personal information and detailed information about the sample) becomes available just by selecting one record in the DataSets table. RawData table is used for storing raw data (large binary file contains photon arrival times or time lags). Each record in the RawData table contains the link to the correspondent DataSet (automatically created during the import of raw data file). generating and printing the reports on the base of the selected records.
? Locate and double-click the FFSDB.EXE file (if you have performed a default installation, this file is located in \Program Files\SSTC\FFS Data Processor\Bin). It is advisable to use Databases having administrative rights. 1. Set modify (not only write) permission to the directory (and all subdirectories) where program is installed (normally it is C:\Program Files\SSTC\FFS Data Processor). Set also write permission to the root C:\ directory (where file PDOXUSRS.NET is located). 3. Set modify permission to the directory where program is installed. Open Options dialog (Tools/Options... menu item) from FFS Measurements Database and set network directory to a folder with write permissions. 4. Open Options dialog (Tools/Options... menu item) from FFS Measurements Database and set network and private directory to folders with write permissions. Open Options dialog (Tools/Options... menu item) from FFS Analysis Database and set private directory to a folder with write permissions. Note. Private directories of both databases must be different. The last way is worst. Some database operations (packing tables, etc. ) may not work properly in some cases. Note: Users of Windows 7 can work with PARADOX databases without any limitations only if they are logged into using the Administrator account (not confuse with any other user account having Administrative rights). Use the way number 2 (preffered), 3 or 4 to work with Databases on Windows 7. There is one more solution of the problem: launch BDE Administrator with system administrator rights (using local menu command) just before opening Data Processor or any database. Files Group panel represents information related to the whole set of files (DataSets table) and Files panel represents information for each file individually (Observat table). For more information about structure of the Database see About Measurements Database. Status bar, which is a horizontal area in Measurements Database below the Files Panel, provides information about the current state of application and any other contextual information. Alias of the current Database is displayed in the right part of the Status bar. Contains menu commands for managing tables and importing/exporting data. Contains menu commands for opening tables. Contains menu commands for finding information. Contains menu commands for sorting tables. Contains menu commands for previewing and printing automatically created reports. 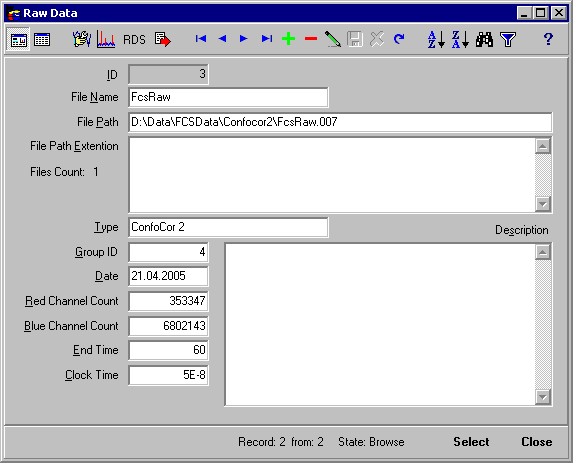 Use the commands of the Tools menu for RawData Processing, communicating with FFS Data Processor and performing some service database functions. Contains menu commands for managing the view of the opened tables. Contains menu commands for accessing the online Help and information about the copyright. Use commands of the File menu for managing tables and importing/exporting data. Opens New Database dialog box to create a new empty Database (set of tables) allowing to keep data in different folders or computers within the local network. One have to specify the Alias for this Database during this operation. Opens Link Tables dialog box for switching between Databases at run time. Imports Files Group(s) with all supplementary information from the selected database to the current Database. Opens Import/Export Data form to select the Database and needed Files Group(s). Exports Files Group(s) with all supplementary information from the current database to the selected Database. Opens Import/Export Data form to select the Database and needed Files Group(s). Finishes the work with Measurements Database. Use the commands of the Tables menu for opening tables. Displays a search box for the corresponding field. If you want to find quickly the necessary record you should type the first few characters and press Enter. In this case the application will automatically select the first record that contains at the beginning the characters, which correspond to the typed ones. For the Numeric, Logical and Data/Time fields you should type the whole value for the correspondent field. To close the search box, press key Esc. Opens Filter dialog box that allows creating the filter that can be applied to the selected table. If this filter is applied, the only table records that correspond to the filter criteria will be displayed. Removes Filter from the selected table. Sorts records of the table in ascending order by the selected field. Sorts records of the table in descending order by the selected field. Use the commands of the Reports menu for setting the page setup, previewing and printing automatically created reports. 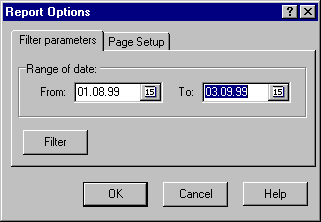 Opens Reports Options dialog box and display the "Page setup" page. Previews the Report. Opens Reports Options dialog box to set the filter on the DataSets table for selecting the records which will be included into the Report. Use the commands of the Tools menu for communicating with FFS Data Processor and performing some service database functions. Reduces size of a table by releasing any free space. Packing can be used for repairing the table, because the table is restructured during this operation. Opens Select Tables dialog box to select the table. Reduces size of all tables by releasing any free space. Packing can be used for repairing the tables, because the tables are restructured during this operation. Deletes all records from a table. Opens Select Tables dialog box to select the table. Deletes all records from all tables. Checks a table. Opens Select Tables dialog box to select the table. Repairs a table. Packing tables can be used also for repairing the table. Opens Select Tables dialog box to select the table. Checks all tables and repairs them if they are corrupted. Packing tables can be used also for repairing the tables. Opens Preview Window for two-dimensional preview of measured or calculated from raw data statistical characteristic as well as standard deviations and relative standard deviations of each point of the statistical characteristic. Opens Options Dialog box to set Borland Database Engine internal variables. Sends selected files in the Files panel to the FFS Data Processor. Sends all files of the current Files group to the FFS Data Processor. Ends the default transaction and reconnects the Database. This command prevents you from loosing your changes you made after the abnormal program termination. Use the commands of the View menu for managing the view of the opened tables. Displays the table as form. Displays the table as datasheet. Displays the copyright and version number for Measurements Database. The Toolbar is a row of buttons at the top of the Main window which represent application commands. Clicking one of the buttons is a quick alternative way to choose a command from the menu. Buttons on the toolbar are activated and deactivated according to the state of the application. Button "View Table as Form"
This button views the table as form. Button "View Table as Datasheet"
This button views the table as datasheet. Button "Send files to FFSDP"
This button sends selected files in the Files panel to the FFS Data Processor. Button "Send Files Group to FFSDP"
This button sends all files of the current Files group to the FFS Data Processor. This button sorts records of the table in ascending order by the selected field. This button sorts records of the table in descending order by the selected field. This button opens Help topic contents. This button displays a search box for the selected field. If you want to find quickly the necessary record you should type the first few characters and press Enter. In this case the application will automatically select for you the first record that contains these characters at the beginning. For Numeric, Logical and Data/Time fields you should type the whole field value. To close the search box press key Esc. This button opens Filter dialog box that allows creating the filter that can be applied to the selected table. If this filter is applied, the only table records that correspond to the filter criteria will be displayed. To find out more about the functionality of any Navigator button, click this button on the figure above. This button moves cursor to the first record. This button moves cursor to the previous record. This button moves cursor to the next record. This button moves cursor to the last record. This button inserts new empty record. This button deletes the current record. This button switches the state of the table in edit mode. After updating information it is possible to save changes by pressing Post button or cancel changes by pressing Cancel button. This button saves the current record. This button refreshes the information in the table. Valuable in multiuser application when several users work with the Database simultaneously. Files Group panel represents information stored in the DataSets table. Name of the DataSet, information about the Guest (person, who requests the measurements) and sample, date of measurements, as well as short description of the measurement, are displayed in this panel. It is possible to perform all manipulation with DataSets table with the help of Database Navigator which is placed in the bottom part of the Files Group panel. In this part you can see number of current record, number of all records and current state of the table. Button Copy allows you to copy all fields from the previous record with the related parameters. It is not necessary to type the name of Guest or name of sample each time when you create a new group of files. It is possible to choose it from the drop-down list. To add new Guest one should press arrow button in right part of Guest combo box. This button is enabled only in Edit or Insert mode. New information for the sample can be entered in the same way. DataSets table can be viewed as a form view or datasheet view. All actions under DataSets table are collected in the local menu. This button copies all fields from the previous record to the current record as well as all related parameters from the Parameters and ExtParameters tables. It is enabled in Edit mode. This button opens Guests Form to add new Guest. Name of the Guest will be pasted in Guest combobox after closing the form by pressing Insert button. It is enabled in Edit mode. This button opens Samples form to add new Sample. Name of the Sample will be pasted in Sample combobox after closing the form by pressing Insert button. It is enabled in Edit mode. Inserts a new empty record in the table. Switches state of the table in edit mode. Saves current record in the Database. Refreshes the information in the table. Valuable in multi-user application when several users work with the Database simultaneously. Copies all fields from previous record to current record. Opens Guests Form to add new Guest. Name of the Guest will be pasted in Guest Lookup after closing the form by pressing Insert Button. Opens Samples Form to add new Sample. Name of the Sample will be pasted in Sample Lookup after closing the form by pressing Insert Button. Calculates Weight Factors for repeated independent measurements with equal conditions (for all files related to the selected Files Group and viewed in the Files grid) as standard deviations of each point of characteristics. To select only needed files use the Filter. Number of selected files should be at least 6. Weight factors will be the same for all files. Clears Weight Factors for all files related to the selected Files Group and viewed in the Files grid. To select only needed files use the Filter. Sends all files from the Files Group to the FFS Data Processor. Generates the report based on the selected record. This panel represents all parameters of the current DataSet (displayed in Files Group panel). This page displays experimental parameters (parameters of equipment, etc.) of the current DataSet. 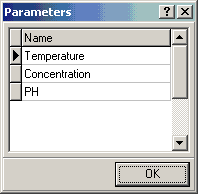 The parameters are stored in the Parameters table. All actions under Experimental parameters table are collected in the local menu. Sorts the DataSets table on the selected Parameter. This page displays external parameters of the current DataSet. The external parameters are stored in the External parameters table. External Parameters are used for storing such parameters as Temperature, Concentration and so on. Additional reason for using External Parameters is the possibility of visualization of the fit parameters as a function of a particular External parameter (for example, measurements were done at Temperature = 10C, 20C, 30C, …) . Field Name is the lookup field. It lookups the information from the PNames table. All actions under External parameters table are collected in the local menu. Allows to add new name of the parameter. Opens Parameters form. Sorts records in DataSets table in ascending order by the selected Parameter. Sorts records in DataSets table in descending order by the selected Parameter. Files panel represents all information about the measured data (Observat table) which are related to the current record in DataSets table (displayed in Files Group panel). Each record in the Observat table describes particular measurement and contains such experimental parameters as Sample Position, Start Time, Duration, etc, as well as array of the measured data. Several records from the table Observat are related to one record in the table DataSets (relationship "many-to-one"). This relationship reflects the experimental configuration when measurements of the same sample under the same external conditions are being performed in series. In this case, certain number of particular measurements should be collected into one global group corresponding to the investigated object. It is possible to perform all manipulation with Observat table with help of Database Navigator which is placed in the right part of the Files panel. In the bottom part of this panel you can see number of current record, number of all records and current state of the table. These buttons allow to import data from FFS and raw data files, export they to ASCII file, perform a preview of the data and see all files together without separating to series related to particular record in the DataSets table. To find out more about the functionality of any button, click this button on the figure on the left. Observation table in Files panel can be viewed only in datasheet view. All actions under Observat table are collected in the local menu. This button opens the (depended of the import type) to import data from the FFS file (contains already calculated statistical characteristics) or from raw data file (binary file contains photon arrival time or time lags). It is necessary to choose the type of data from the "Import Type" combobox before importing. 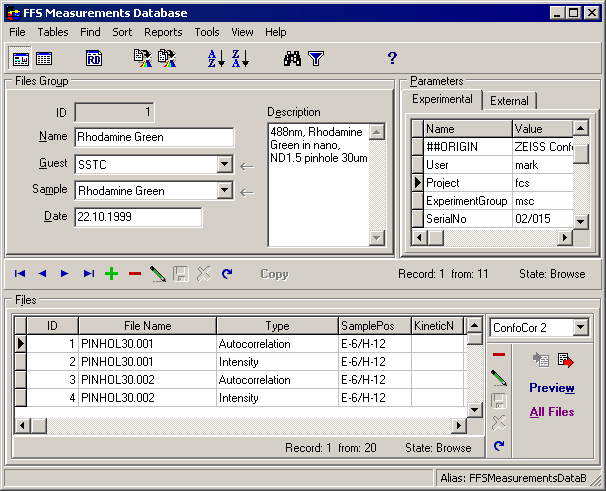 Date of measurement, description of the sample and all equipment parameters are imported automatically. This button exports measured data to ASCII file. Opens the standard Save file dialog box to select the file. This combobox allows to choose the import type. This button opens Preview Window for two-dimensional preview of measured or calculated from raw data statistical characteristic as well as standard deviations and relative standard deviations of each point of the statistical characteristic. The standard deviations (and relative standard deviations) can be viewed if they were calculated and stored (the field IsWeight in the Observat table indicates it). This button opens Files Form. In this form all files are displayed together without separating them to series related to particular record in DataSets table. It allows to find needed files more quickly. Opens the (depended of the import type) to import data from the FFS file or from raw data file. It is necessary to choose the type of data from the "Import Type" combobox on the Files panel. Date of measurement, description of the sample and all equipment parameters are imported automatically. Saves current record to the Database. Sends selected file(s) in the Files panel to the FFS Data Processor. Exports measured data to the ASCII file. Calculates Weight Factors assuming known statistics on the noise. It is enabled not for all types of characteristics because unknown noise statistics. This form is used for working with Guests table. It displays all information about person or organization who orders measurements. To find out more about the functionality of any component, click this component in the figure. Represents all fields from Guests table. It can be viewed as a form view or datasheet view. 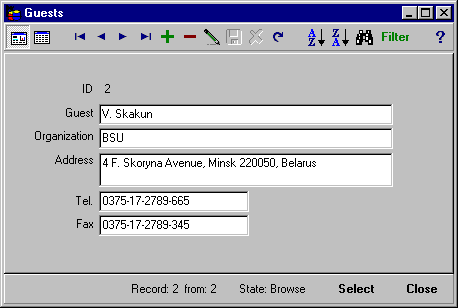 This button closes the form and selects the first record in DataSets table (represents in Files Group panel in Main window) which correspond to the current Guest in this form. This button closes the Guests form. This button opens the help window that describes how to work with the form. This form is used for working with Samples table. It displays all information about samples which were used in measurements. All actions under Samples table are collected in the local menu. Represents all fields from Samples table. It can be viewed as a form view or datasheet view. 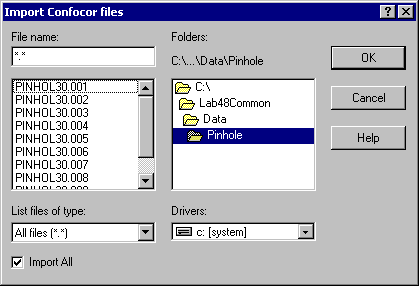 This button closes the form and selects the first record in DataSets table (represents in Files Group panel in Main window) which correspond to the current Sample in this form. This button closes the Samples form. This form is used for working with all records of the Observat table without separating to series related to a particular record in the DataSets table. Represents all fields from Observat table. It can be viewed as a form view or datasheet view. This button closes the form and selects this file in Files panel in Main window. This button closes the Observation files form. This form is used for working with Raw Data table. Each record in the Raw Data table is linked to the correspondent record in the DataSets table (which is automatically created during the import of raw data file). One can link many raw data files to one record in the Raw Data table when necessary. Especially it is useful when these raw data files represents a series of repetitions of the measurement with the same conditions. It reduces the number of records in the table and allows calculating of statistical characteristics from each repetition just by clicking one button. All actions under Raw Data table are collected in the local menu. Represents all fields from Raw Data table. It can be viewed as a form view or datasheet view. This button closes the form and selects the first record in DataSets table (represents in Files Group panel in Main window) which correspond to the current Raw Data record in this form. This button closes the Raw Data form. Opens RawDataBuilder.hlp>mainBursts counting window for counting of coincidence bursts as well as bursts in separate channels. Button "Export Raw Data to the ASCII file"
This button exports raw data to ASCII file. Opens the standard Save file dialog box to select the file. Exports Red channel data to the first column, Blue channel data to the second one. Opens Raw data builder for the raw data processing. Use to simulate the Raw Data time trace with constant intensity and given autocorrelation function (in form of pairwise stochastic point process). Opens Raw Data Simulator form. Displays a search box for the corresponding field. If you want to find quickly the necessary record you should type the first few characters and press Enter. In this case the application will automatically select the first record that contains at the beginning the characters, which matched the typed ones. For the Numeric, Logical and Data/Time fields you should type the whole value for the correspondent field. To close the search box, press key Esc. Removes the filter from the table. Selects related record in the main form. This window is used to display stored in the current record of the Files panel the measured (or calculated from raw data) statistical characteristic as well as standard deviations and relative standard deviations of each point of the statistical characteristic in two-dimensional space. Standard deviations (and relative standard deviations) can be viewed if they were calculated and stored (the field IsWeight in the Observat table indicates it). Name of the file, name of the Files Group and type of stored data are displayed in the title of this window. Use Navigator in the bottom part of this window to display characteristics of other files of current group. This Chart displays stored in the current record of the Files panel the measured or calculated from raw data statistical characteristic as well as standard deviations and relative standard deviations of each point of the statistical characteristic in two-dimensional space. Dimensions of X and Y axis depends from the type of the characteristic. Opens the help window that describes how to work with Preview window. This button closes this window. This Navigator allows to scan measured data from the files belonging to the current Files Group. Switches on/off the preview of the stored statistical characteristic. Switches on/off the preview of the stored standard deviations of each point of the statistical characteristic. This button is unavaiable if standard deviations have not been calculated. To calculate them check Weight cacl. check box (it allows to calculate standard deviations of each point of the characteristic from the raw data) or use Calc. Weight local menu command of the DataSet panel of the main window (it allows to calculate standard deviations of each point of the characteristic from the set of characteristics measured (or calculated from the raw data) under the same conditions). Switches on/off the preview of the relative standard deviations of each point of the statistical characteristic. This form is used for working with PNames table. It displays the names of the external parameters. All actions under PNames table are collected in the local menu. Displays the name of the external parameter (PNames table). Use this form to copy the Files Group(s) with all supplementary information (files, parameters, linked raw data, etc.) from one database to another. This button starts the import procedure. This button stops the import procedure. Closes the dialog box without performing the action. This button opens the help window that describes how to work with Import/Export Data form. This table is used to select the source database. 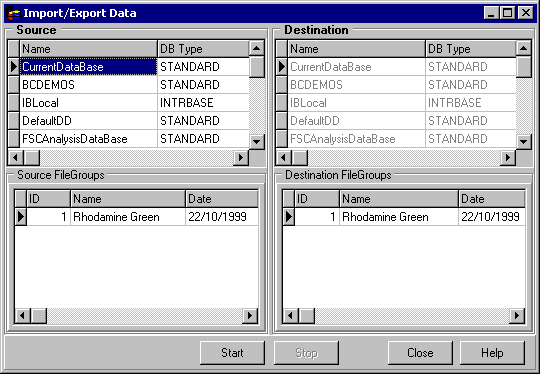 This table is used to select the destination database. This table is used to select source Files Group(s). It is possible to select many File Groups. This table represents FileGroups, stored in the Destination database. Selects all records in the source FileGroups table. This dialog box is used for customizing the Report and selecting records which will be included into the Report. You can specify Page Setup settings to adjust the printed area. This page is used for selecting records which will be included into the Report. This panel allows to specify the range of dates. You can use built-in calendar by clicking on the small button in right part of Editor. This button closes the dialog box and starts creating the report. This button closes the dialog box without creating the report. This button opens Filter dialog box that allows creating the filter that can be applied to the selected table. If this filter is applied, the only table records that correspond to the filter criteria are displayed. This button opens the help window that describes how to work with Reports Options dialog box. This page is used for setting paper size and paper margins for the report. Enter Height of your paper here. Enter Width of your paper here. Left Margin Enter the distance you want between the left edge of the page and the left edge of unindented lines. Rght Margin Enter the distance you want between the right edge of the page and the right end of the line with no right indent. Top Margin Enter the distance you want between the top of the page and the top of the first line of the page. Bottom Margin Enter the distance you want between the bottom of the page and the bottom of the last line of the page. Use this dialog box to set internal variables of Borland Database Engine. 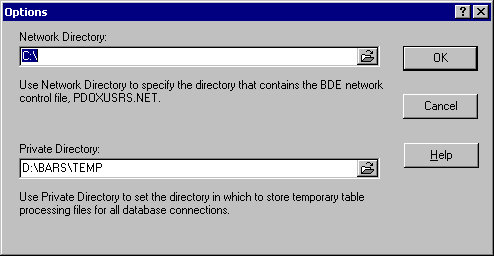 Use Network Directory to specify the directory that contains the BDE network control file, PDOXUSRS.NET. This file governs the sharing of Paradox tables on network drives. All applications that share Paradox tables on a network directory must specify the same value for this property, and must have read, write, and create rights for the directory. Use Private Directory to set the directory in which to store temporary table processing files for all database connections. For applications that run directly from a networked file server, the application should set PrivateDir to a user's local drive to improve performance and to prevent temporary files from being created on the server where they might conflict with temporary files created by other instances of the application. Closes the dialog box and set variables. Closes the dialog box without setting variables. This button opens the help window that describes how to work with Options dialog box. Opens standard Browse Directory dialog box. Use this dialog box to create a new empty Database (set of tables) allowing to keep different data in different folders or even computers within the local network and easily switch between Databases at run time. 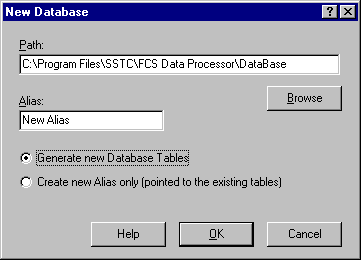 You must specify the Alias for this Database in Alias edit. An alias is a name and a set of parameters that describe a database resource. 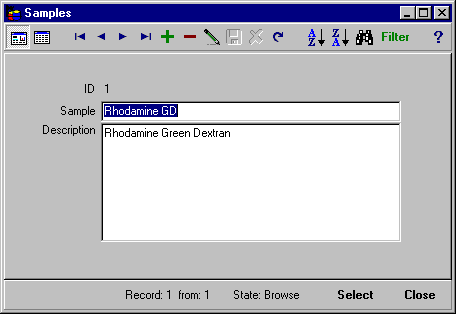 BDE applications use aliases to connect with databases. If you want to use remote (writing local network) access to the Database you must set the Network Directory (Tools/Options... main menu item). Is used to input new alias. Closes the dialog box and performs the action. This button opens the help window that describes how to work with New Tables dialog box. If this radio button is checked, new empty database tables will be created in the specified path. The alias that is pointed to the Database will be created as well. If this radio button is checked, only alias that is pointed to the database tables located in the specified path will be created. New empty database tables will not be created. Use this dialog box to switch between Databases at run time. Closes the dialog box and performs the link with the selected tables. This button opens the help window that describes how to work with Link tables dialog box. Represents alias, type and path of all registered databases at the local machine. Represents name, date and size of the tables of the database. Use this dialog box to select the table. This button opens the help window that describes how to work with Select table dialog box. Use this dialog box to import data from the FFS file to the Measurements Database. 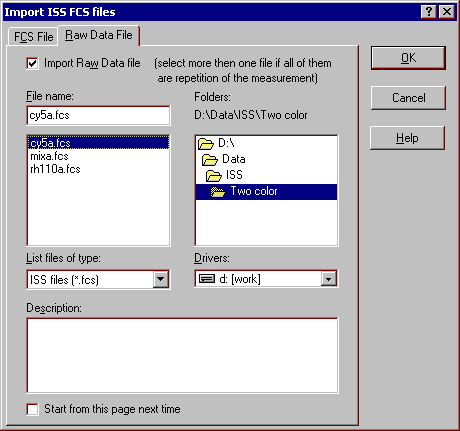 Use FFS file page of this dialog box to import data from the FFS file to the Measurements Database. The correspondent raw data can be also imported through Raw data file page of this dialog box (actually a link to the file is stored). One can link many raw data files to one record in the Raw Data table when necessary. Especially it is useful when these raw data files represents a series of repetitions of the measurement with the same conditions. It reduces the number of stored records and allows calculating of statistical characteristics in Raw Data Builder from each repetition just by clicking one button. Uncheck the Import FFS file check box if you want to import raw data file only. This button closes the dialog box and starts importing the file to the Measurements Database. This button closes the dialog box without importing the file to the Measurements Database. This button opens the help window that describes how to work with the dialog box. This edit provides a space for you to type the name of the file you want to import to the Measurements Database. If this checkbox is checked, the FFS file will be imported to the Measurements Database. This list shows files in the selected folder. To quickly select a file, click the file name in the list. This combobox allows selecting the type of files to display. This box shows the drive and folder you have selected. Use this combobox to select a drive from the Drive drop-down list. If this checkbox is checked, all files with the same name (extension may be different) will be imported to the Measurements Database. 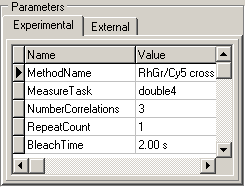 If this checkbox is checked, cross-correlation function will be imported to the Measurements Database. If this checkbox is checked, fluorescence intensity for channel 1 (red) will be imported to the Measurements Database. If this checkbox is checked, fluorescence intensity for channel 2 (blue) will be imported to the Measurements Database. If this checkbox is checked, photon counting histogram for channel 1 (red) will be imported to the Measurements Database. If this checkbox is checked, photon counting histogram for channel 2 (blue) will be imported to the Measurements Database. If this checkbox is checked, inter-event time histogram for channel 1 (red) will be imported to the Measurements Database. If this checkbox is checked, inter-event time histogram for channel 2 (blue) will be imported to the Measurements Database. If this checkbox is checked, autocorrelation function for channel 1 (red) will be imported to the Measurements Database. 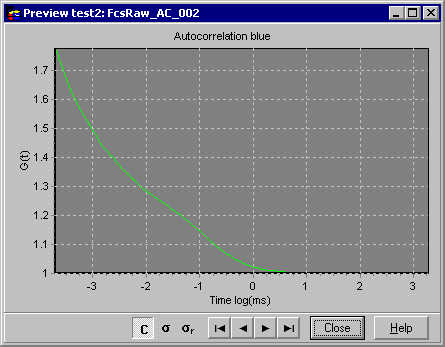 If this checkbox is checked, autocorrelation function for channel 2 (blue) will be imported to the Measurements Database. Allows to describe the imported raw data file. If this checkbox is checked, next time the Raw Data File page will be shown at the beginning. If this checkbox is checked, the raw data file will be imported to the Measurements Database. Use FFS file page of this dialog box to import data from the FFS file (has the extension csv) to the Measurements Database. The correspondent raw data (has the extension FFS) can be also imported through Raw data file page of this dialog box (actually a link to the file is stored). One can link many raw data files to one record in the Raw Data table when necessary. Especially it is useful when these raw data files represents a series of repetitions of the measurement with the same conditions. It reduces the number of stored records and allows calculating of statistical characteristics in Data Builder from each repetition just by clicking one button. Use the dialog box to import raw data to the Measurements Database (actually a link to the file is stored). If the raw data represented by a series of files (differ by only its number) select all of them. They will be processed as single one. One can link many raw data to one record in the Raw Data table when necessary. Especially it is useful when these raw data files represents a series of repetitions of the measurement with the same conditions. It reduces the number of stored records and allows calculating of statistical characteristics in Data Builder from each repetition just by clicking one button. Is used to store information about the measurements (usually imported from FFS files. Several records from the Observat table are related to one record in the DataSets table (relationship "many-to-one"). It is used also for storing the statistical characteristics derived from the raw data. Identifier of the record in DataSets table. Needs the relation to the DataSets table to be established. Time step. It is calculated from the imported data in case of measured data.
? Field ObservationID is read only.
? This table can be sorted by any field (except CorrData and Weight). To perform the sorting by the given field, select this field and press Ascending/Descending Sort button in the Toolbar or choose Ascending/Descending menu items in the local menu.
? Use Quick Search button in the Toolbar or choose Quick Search menu items in local menu for quick searching the information in the selected field. Is used to store information related to one group of files. Several records from the DataSets table are related to one record in the Guests table and to one record in Samples table (relationship "many-to-one"). Identifier of the records in Guests table. Needs the relation to the Guests table to be established. Identifier of the records in Sample table. Needs the relation to the Sample table to be established.
? Field DataSetID is read only.
? This table can be sorted by any field (except Description). To perform the sorting by the given field, select this field and press Ascending/Descending Sort button in the Toolbar or choose Ascending/Descending menu items in the local menu. Contains information about person or organization who orders measurements.
? Field GuestID is read only. Contains the detailed information regarding the explored sample.
? Field SampleID is read only. Is used to store the equipment parameters. Several records from the Parameters table are related to one record in the DataSets table (relationship "many-to-one").
? Field ParameterID is read only.
? This table can be sorted by any field. To perform the sorting by the given field, select this field and press Ascending/Descending Sort button in the Toolbar or choose Ascending/Descending menu items in the local menu. Is used to store the external parameters. These parameters are used for displaying dependence of estimated parameters (Estimated parameter versus External parameter). Several records from the External parameters table are related to one record in the DataSets table (relationship "many-to-one"). While entering the parameter it is necessary to add the parameter name to the PNames table.
? Field Name is the lookup field. It lookups the information from the PNames table. Is used to store the external parameter names. It is created in order to avoid mistakes while entering external parameter names. At the beginning it is necessary to add the parameter name to the PNames table then this parameters can be chosen from drop-down list in the External parameters page of the Parameters panel. Contains link to the raw data file(s) and some other information. 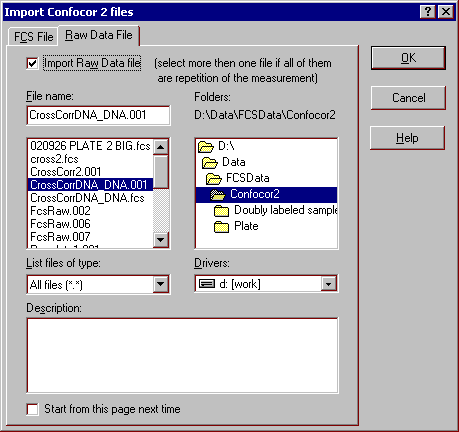 Each record in the Raw Data file is linked to the correspondent record in the Data Sets table (that is automatically created during the import of raw data file). One can link many raw data files to one record in the Raw Data table when necessary. Especially it is useful when these raw data files represents a series of repetitions of the measurement with the same conditions. It reduces the number of records in the table and allows calculating of statistical characteristics from each repetition just by clicking one button. The Files Count field represents the number of files linked to the current record. Contains ID of the record in the DataSets table that is linked to current record.
? Field ID is read only.
? Field Files Count shows the number of raw data files linked to the record.
? This table can be sorted by any field (except Description). To perform the sorting by the given field, select this field and choose Ascending/Descending menu items in the local menu.
? Choose Quick Search menu items in local menu for quick searching the information in the selected field. 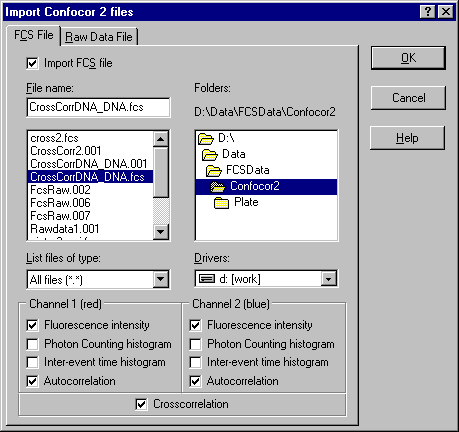 FCS file contains statistical characteristics like as auto(cross)correlation, photon counting histogram, etc., already calculated by data acquisition card. Raw data files contains photon arrival times or time lags between consecutive photons. Usually stored in binary file in FIFO mode accordingly special dataformat. 1. Two column data without a caption. Values inside one row can be separated by a number of spaces or tabs. The first column must contain X values, the second Y values. Time has to be in milliseconds for AC(C)F.
2. Three column data without a caption. Values inside one row can be separated by a number of spaces or tabs. The first column must contain X values, the second Y values, the third - weight factors (standard deviations of each Y). Time has to be in milliseconds for AC(C)F.
3. specially formatted files having either SSTC_2Column_data_with_params or SSTC_3Column_data_with_params. Parameters section comes directly after this line. #Normalization=integer value. It must be 1 for ACF, CCF, FFC, and be equal to either 1 or to number of processed bins in the intensity for PCD (preferably), i.e. be equal to sum of all bin heights in the histogram. It is assigned to 1 if it is not supplied. Parameters will be imported only if the #Version equal to ‘SSTC_2Column_data_with_params’ or ‘SSTC_3Column_data_with_params’. 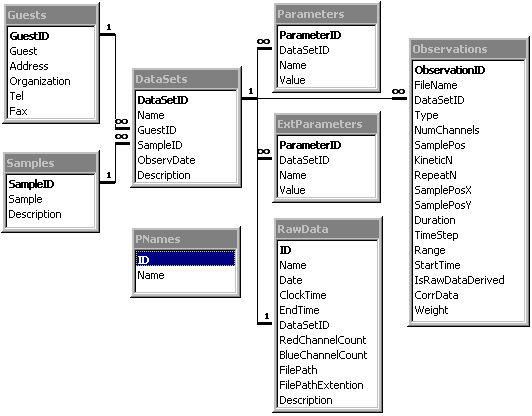 See below available parameter names and data types. No spaces must surround ‘=’ sign. 3 column – weight (it can be equal to Y (Poisson statistics), 1 (no weight), or be properly calculated). Do not put zeros in this column. A point with zero weight does not participate in the analysis. Note: Algorithm can also read two channel data (without weight). It is equivalent to setting #Version to SSTC_2Column_data_with_params.